You remember the day you bought your grill and promised yourself to keep it clean an nice? Well if you are like most of us then this promise did probably do not last too long. We all love to grill and smoke, but when it comes to cleaning this is not our most favorite thing to do. Most people think that all they have to clean is the grill grates and the rest is not important. However, it is a fact that all the stuff that falls through the grates the next time you cook will make the meat get a bad taste and can even cause health issues. You would not leave your stovetop or oven dirty would you? To prevent the grill bottom from getting too dirty and easy cleaning I line it with aluminum foil. You can read our grill brush reviews here and the type of brush is depending on your way of grilling and the type of grill grate you have. After the grill cooled down, pick up the aluminum foil from the bottom and trash it. Inspect the bottom of the grill for dirt and sometimes you will find grease there. Most grills have a hole in the bottom so get a bucket of water and soap and clean the bottom. If you use your grill just once and a while you will have to do this step after every use. If you are a more frequent user like me you can do this once a week. Clean the bottom of the grill real good with water and soap. Let your grill warm up for at-least 10 minutes before you start cooking to clean out any soap residue. The steps in this one depending on what kind of grill you have. A charcoal grill needs a different approach than a gas grill, because of the burners. Heat up your grill and let it sit for a while to make sure all the soap and water is vaporized. If you are not the type of persons that grills all year around it is good to give your grill a good cleaning end of the season and store it dry to prevent rust. Clean it as I mentioned in the monthly cleaning and after that take your time to do some maintenance. Replace parts that look like they need replacement like burners or heat shields. Use a good quality cover and store your grill in a dry place. I think if you follow these steps (and you might have some more) your grill will just need a little dusting and a few minutes of pre-heating for the next season. 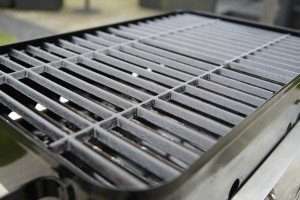 I found some tips on how to clean the grill grates without brush here. Feel free to add your experience with cleaning and or storing your grill. Every tip that can make our life easier and our food saver is worth sharing.